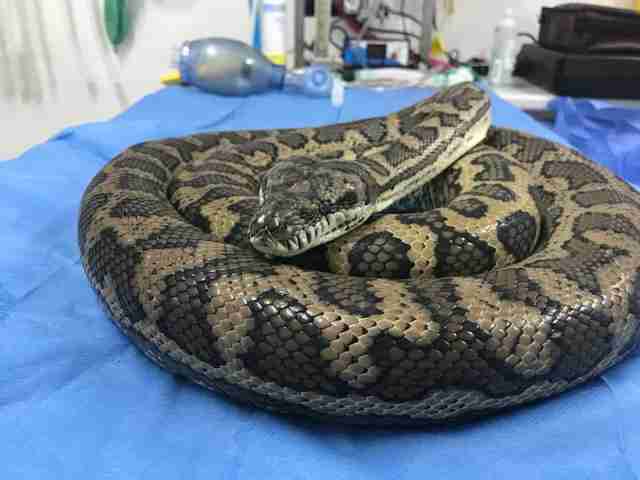 Veterinarian Josh llinas knew the wild carpet python had eaten something he shouldn’t have. The snake’s stomach was swollen in the middle, and llinas had a sneaking suspicion that a shoe was stuck inside. Earlier this week, the wild snake had snuck into someone’s house in Queensland, Australia, and made himself at home in the master bedroom. After noticing this uninvited guest, the homeowner called a local snake catcher to remove the animal and release him back into the wild. 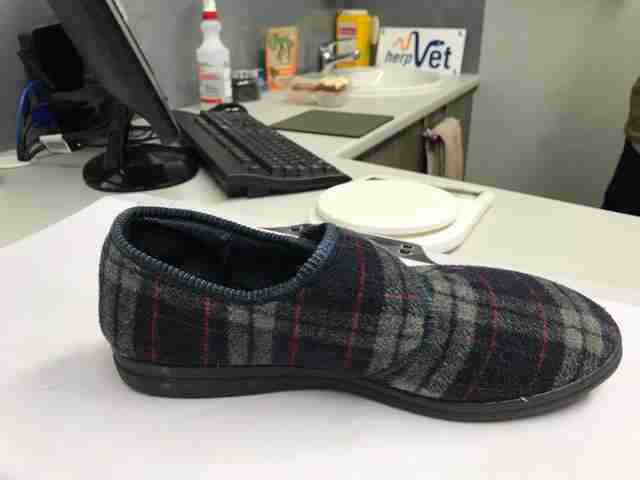 But the homeowner noticed something else — a slipper was missing. If the snake had eaten the missing slipper, he could be in trouble. While carpet pythons have the ability to eat and digest large meals, he wouldn’t be able to pass a slipper through his system — and this would cause the snake to starve and develop other health issues. 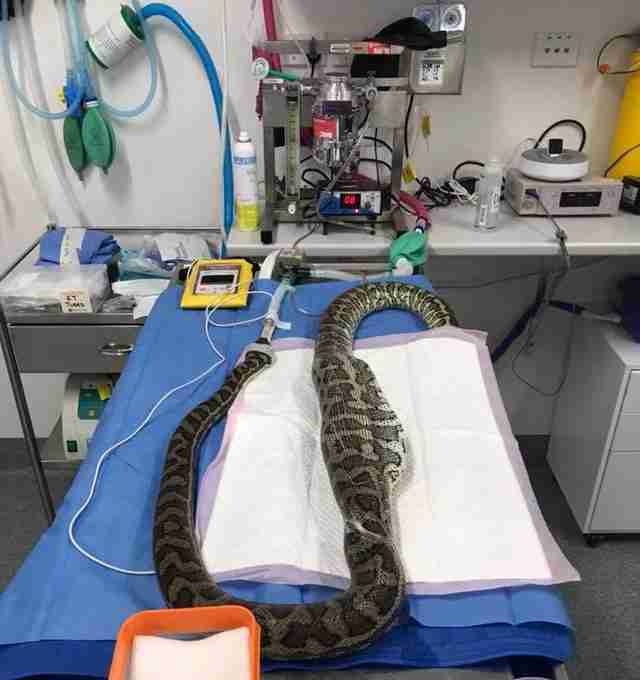 Realizing this, the snake catcher took the python, who’s being called Steve, to Greencross Vets Jindalee, where Ilinas works as a vet specializing in reptiles and amphibians. 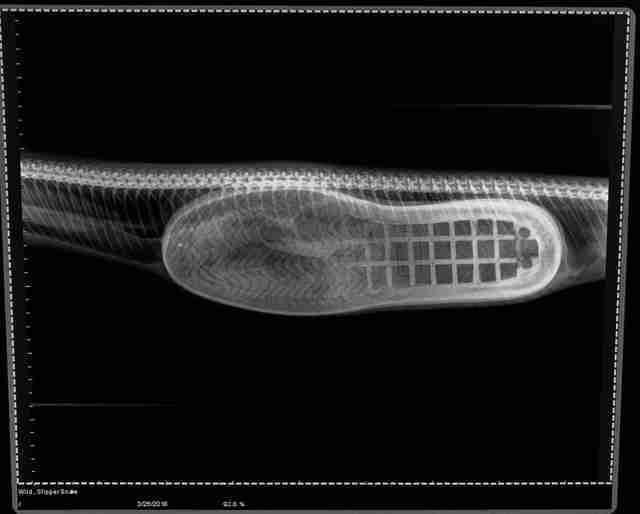 When llinas took an X-ray, his suspicions were confirmed — Steve had eaten the slipper for dinner. “This made for one of the most impressive radiographs I have seen,” llinas wrote in a Facebook post. However, llinas told The Dodo that Steve’s situation wasn’t unusual. 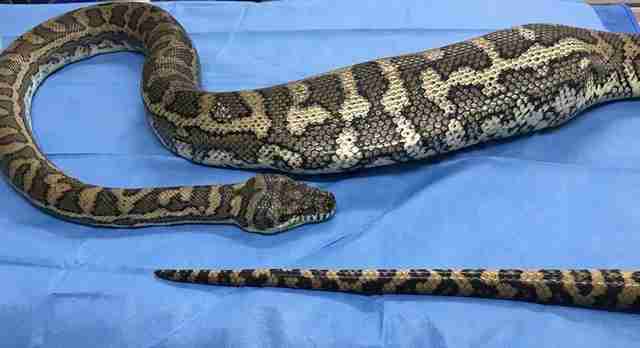 “I have recently removed a pillowcase from a black-headed python and tennis ball from another carpet python,” he said. Snakes have also been known to eat household objects like doorknobs or teddy bears. To save the snake’s life, llinas performed a 90-minute surgery to remove the slipper from Steve’s belly, then carefully stitched him back up. Once he’s fully recovered, Steve will be released back into the wild — and hopefully, he’ll make better food choices in the future.